Hazelnut Mocha Cupcakes with Coffee Butter Cream Frosting Recipe: Sponsored by Bob’s Red Mill Natural Foods | Exploring Food & Drink in D.C.
Grated semi-sweet chocolate for garnish. Sift together all dry ingredients. Some of the Bob’s might not make it through the sifter, so just dump those pieces back into the sifted ingredients and give it a quick stir. In a separate bowl combine eggs, vanilla, and butter. Whisk together. Make a well in your dry ingredients and add in the egg mixture. Line your cupcake pan with your favorite liners. Fill your liners ¾ full. Bake for 18-19 minutes. Check using a tooth pick or fork. Allow to thoroughly cool before frosting. When ready to frost, blend together butter and sugar. Slowly add in cream and coffee until desired flavor and consistency has been reached. Mix on medium for 2-3 minutes. Butter Cream frosting should be light-ish with soft peaks. Pipe onto cupcakes and garnish with grated semi-sweet chocolate. *The frosting makes enough to generously frost 24 cupcakes if you’re doing a single layer frosting. We were sponsored Bob’s Red Mill Natural Foods for a second recipe as part of the Blogger Recipe Challenge. This time around we decided to play with their Hazelnut Meal/Flour a bit. After reading about the best uses for their Hazelnut Meal we decided to substitute some of the flour for the meal. We weren’t trying to do anything gluten-free. We really just wanted it for that extra hazelnut kick, and a slightly coarser texture. We beyond loved how these cupcakes turned out. They rose and baked up nicely, taste phenomenal, and were very moist. Definitely cupcakes we’ll be making again and again with the use of Bob’s Red Mill. Bob’s Red Mill can also be purchased through Amazon. Tags: Bobs Red Mill, Chocolate, Coffee, cupcake, dessert, Hazelnut, recipe. Bookmark the permalink. Yum, Hazelnut is my favorite. I want to eat this right now. Looks like some great recipes here! Yum! Your cupcakes look absolutely delicious! I’m drooling right now. I am a big fan of cupcakes as it is, but coffee butter cream frosting? I am sold. This is basically all of my favorite things wrapped together in my favorite dessert package. Great cupcake recipe. Thanks for sharing. I’m inspired to do some baking now. OMG. I was just looking around for a recipe for this weeks church dessert picnic. YUM YUM YUM! Those look amazing! And they are made with Bobs Red Mill? Wow, how awesome. Thank so you so much! These look amazing! I’m sure they would be a big hit in my house. Okay, seriously! I don’t know where to start!? These cupcakes look and sound absolutely incredible. Now.. I REALLY want to try Bob’s Red Mill Hazelnut Meal… I haven’t heard of this yet! I am trying to eat a bit differently and have been considering their products. Great timing! Thanks for sharing the fun! I love these and the picture is beautiful. Wow what a fabulous treat! Thanks for much for sharing this! I love anything with chocolate and coffee flavors. These muffins look like they taste amazing. Wow, those are gorgeous! I love hazelnut. Keep your fingers crossed that mine come out looking as good as those! I bet the hazelnut is amazing in these! They look beautiful! You had me at hazelnut! These sound really tasty. I love hazelnut flavor!!! These look delicious!!! I can’t wait to try them!! Yummy! I love every part of this cupcake and they are beautiful! I would love to make these! I love Bob’s Red Mill products, especially their coconut and almond flours. I am drooling over this recipe, sounds great! Oh these sound so good. I am a nut for anything mocha, so I will be trying these. Now these simply look divine! Holey camoley! Those look delicious! Can I get one of those air lifted to me? Yum! That frosting looks awesome – can I just have that with a spoon? I don’t think I’ve ever heard of Bob’s Red Mill Natural Foods but I’d love to try this recipe! The cupcakes look amazing! Oh my goodness – these look scrumptious! My husband happened to be walking by when these were up and he now wants me to make them. LOL. OH my word, do those ever look and sound good. The flavor sounds absolutely scrumptious! 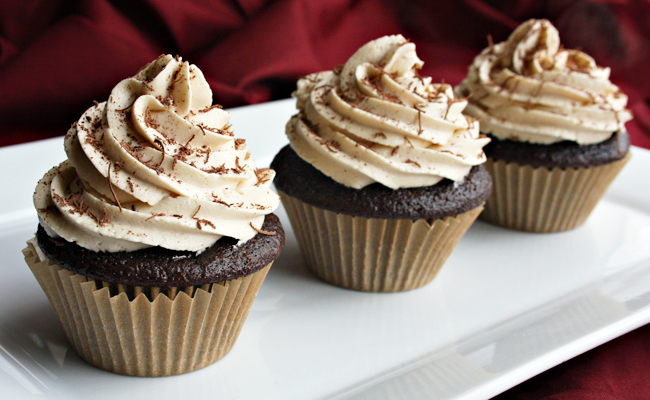 These hazelnut mocha cupcakes look really delicious! Thanks for sharing the recipe, will try them out for sure!